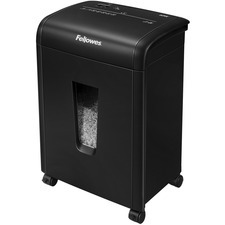 The Fellowes Powershred 62MC Micro-Cut Shredder can shred up to 10 sheets of paper per pass into 2011 (7/64"x 25/64" Security Level P-4) micro-cut particles providing ultimate protection of confidential documents.This machine also safely shreds credit cards and staples. To protect more than your identity, the patented SafetyLock feature disables the shredder when moved to the lock position for added safety protection. 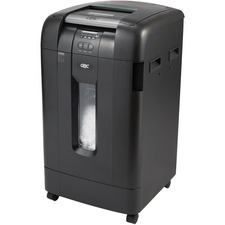 With the ability to shred for up to 7 minutes before a cool down period is needed, the 62MC shredder is ideal for personal deskside use and includes a 5-gallon pull-out bin. Backed by a worry-free 1-year product and service warranty plus a 5-year cutter warranty. 18.75" H x 13.75" W x 10.44" D.
The new innovative Fellowes SB-87Cs with Patent-Pending Safe Sense Technology features an active sensor that stops shredding immediately when paper entry is touched. Designed for frequent shredding needs, the Fellowes Powershred SB-87Cs delivers a high level of performance that's ideal for small business or home office use. The SB-87Cs easily accepts standard letter or legal size documents. SB87Cs shreds CDs in a designated safety slot and the durable steel cutters also accept credit cards, staples and small paper clips. 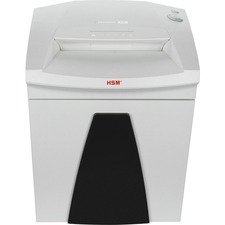 HSM Classic 125.2cc Cross-Cut Shredder - Cross Cut - 18 Per Pass - 20 gal Waste Capacity Timeless quality. Unmatched design. This machine is the perfect solution for delivering the peace of mind you want...and the maximum performance you deserve. Ideal for busy offices.Optimized cutting device technology tears through 16-18 sheets of paper, creating 516 cross-cut/confetti-cut particles per page. Also shreds staples, paper clips, and credit/store cards. White glove is inside delivery service of the shredder to the location of the customer's choice &amp; debris removal. High quality materials and "Made in Germany" quality for security and durability. Lifetime warranty on cutting cylinder. Automatic return eliminates paper jams. Powerful motor allows for continuous operation. Quiet Operation - whisper like noise level during shredding. Solid Steel Cutting Cylinder made from 100% solid steel for high cutting capacities. TAA Compliant. Safety element prevents unintentional entry. High quality wooden floor cabinet with door. Mobile on castors. Automatic start/stop and on/off switch with integrated reversing function. Convenient and effortless removal and emptying of collection bag. 20-gallon bin. Strip-cut paper shredder features optimized cutting device technology that destroys 28 to 30 sheets of paper, creating 38 strip-cut particles per page. It also shreds staples, paper clips, credit/store cards and CDs/DVDs. High-quality materials provide safety and durability. Anti-Jam Technology prevents jams if machine is overloaded. Continuous-duty operation ensures continual shredding with no downtime. Energy Management Control System EcoSmart allows particularly low power consumption of 0.1 watt in standby mode. Quiet operation minimizes noise development in the workplace. Cutting rollers are made of hardened solid steel. With a Comprehensive Safety System, shredder is UL Approved and CE-Certified. For high user safety, the folding safety element prevents unintentional intake. Design also includes a multifunction element for intuitive operation; light barrier for automatic start/stop; and inspection window to monitor filling level. Light-duty, cross-cut shredder features overload protection and built-in thermal protection to prevent the system from getting dangerously hot. Cool-down meter on the housing top displays a bar progression to indicate that the unit is getting hotter. When the unit reaches its maximum run time, the meter will indicate that the unit is too hot and will go into auto cool down mode. The system also indicates when the system has cooled down and is ready to shred. Shredder cuts 15 sheets of 20 lb. paper in a single pass at 4' per minute. Shred size is 5/32" x 1-3/8". Shredder also accepts CDs/DVDs, credit cards, staples and paper clips. 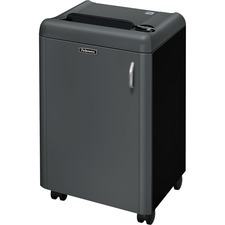 Design also features overload protection, a 7.1 gallon pullout waste bin and casters for portability. 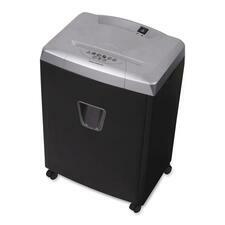 Micro-cut shredder destroys paper clips, staples and documents into an 8-gallon, pullout waste bin. Jam-free technology ensures high-security, micro-cut shredding for hassle-free performance. Indicator glows red when too much paper is inserted to prevent jams before they happen. Micro-cut shredder meets your high security needs (Level P-5) and shreds up to 11 sheets at a time. Self-cleaning cutters automatically remove shreds that cause buildup and lead to jams. Power Save auto shutdown with automatic wake-up conserves energy to lower overall costs. Mobile shredder features hardened cutting rollers for ripping through two to three layers of tough cardboard. Specially shaped cutting rollers deliver a long service life and guarantee that the material is evenly padded. Continuous-duty operation ensures continual shredding with no downtime. Sturdy sheet steel housing is ideal for use in dispatch and warehouse areas. Thermal fuse protects against overheating. 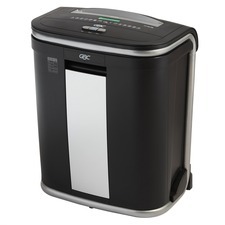 Mobile shredder also features three-phase power connection; on/off and reverse rocker switch; dust extraction system connectivity. It complies with national and international safety regulations. Swingline® Stack-and-Shred™ 600M Auto Feed Shredder, Micro-Cut, 600 Sheets, 10-20 Users - Micro-Cut, 600 Sheets, 10-20 Users Just stack, shut and you're done with America's #1 Selling Brand in Auto Feed Shredders. Everyone will appreciate the ability to automatically, micro-cut shred stacks of up to 600 letter or legal sheets with the Stack-and-Shred™ 600M. Plus, the manual feed allows easy shredding of up to 9 sheets. 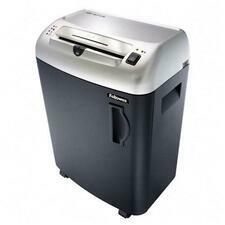 Credit cards and DVD/CD shredding features also included. Intelligent Auto+® Jam Clearance/Interactive Jam Clearance technology and locking capability ensures hassle-free, secure performance. The HS-440 has been evaluated by the NSA and meets the requirements of NSA/CSS Specification 02-01 for High Security Cross-Cut Shredders. TAA Compliant. SilentShred™ offers ultra-quiet performance for shared workspaces. The electronically controlled Safety Shield stops shredder when opened. 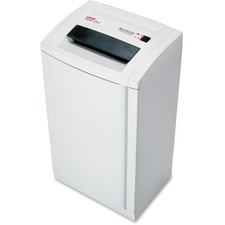 Shredderautomatically shuts off after 30 minutes of inactivity for zero energy consumption. Shreds 4 sheets per pass into unreconstructable 1/32" x 3/16" cross-cut particles for NSA-approved security (Security Level P-7). 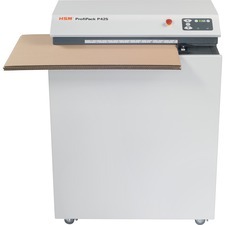 Features 9.5" paper entry plus continuous duty motor for non-stop shredding. Requires a dedicated 15 amp outlet for optimal performance. 9.25 gallon bin. 1-year product warranty plus 1-year cutter warranty. For shared use.